Whilst experiencing some of the most spectacular scenery that the Isle of Anglesey has to offer, stop by one of the most iconic buildings on the island, The Oyster Catcher in Rhosneigr, for some delicious food and friendly hospitality. For those travelling to and from Anglesey, The Oyster Catcher’s beach-side location is ideally situated for exploring its picturesque coast and experiencing the local wildlife. Local attractions such as The Dingle Nature Reserve, Anglesey Sea Zoo and Beaumaris Castle are right on the pub’s doorstep and with Snowdon Mountain Railway just 26 miles away, those looking to summit Wales’ highest mountain can relax after hard day’s climb in the comfortable surroundings of The Oyster Catcher. The Oyster Catcher is open from 10am every day and serves only the very best British cuisine. From Smoked Haddock, Salmon and Cod Fish Pie to Chargrilled Welsh Beef Steaks, The Oyster Catcher’s chefs produce a plethora of delicious dishes using local produce where possible, which is sure to tempt the most discerning of guests. The pub’s extensive wine list is popular with regulars and visitors alike and, for the real ale and beer enthusiasts, the bar stocks recurring guest ales including favourites from the North Wales’ Conwy Brewery and Great Orme Brewery. On-site parking is in ample supply at the Maelog Lake-based venue, making it the ideal place for coach tours and large groups to take a break from their long journey. Friendly staff at The Oyster Catcher will ensure that everyone is catered for and coach drivers can also benefit from a free meal, drink and takeaway coffee* when choosing the pub as their main-meal stop. 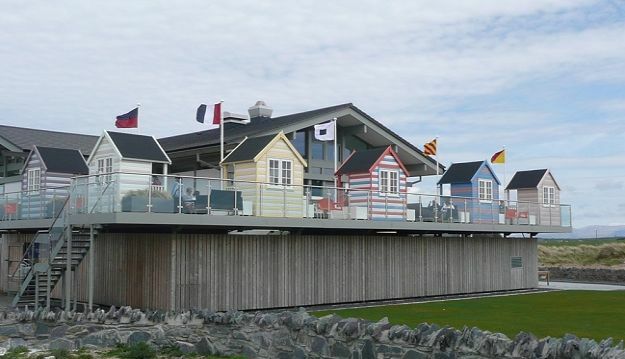 So, whether you’re looking for somewhere to relax after a Winter walk on the beach or want to enjoy a glass of wine on the sunny terrace during the Summer, The Oyster Catcher offers the ultimate seaside stop off-point for groups of all ages and sizes.